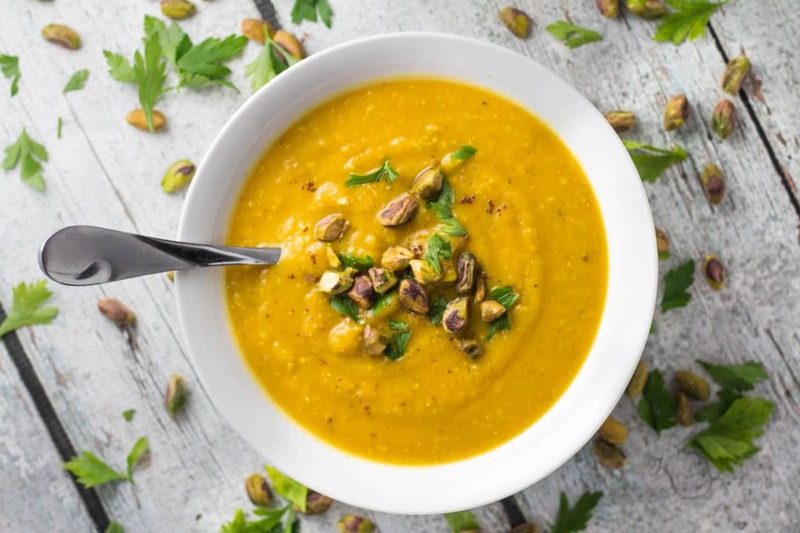 With flavors of pumpkin and a hint of nutmeg dancing on your tongue, this pistachio pumpkin soup is guaranteed to be a keeper! You will be sure to Fall in love with this Pistachio Pumpkin soup! 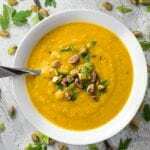 Click here to pin this Pistachio Pumpkin soup recipe for later! This recipe is easily made using a powerful blender. Once you boil off your potatoes and they are tender – you will essentially transfer all ingredients into the blender and blend well! I use a Vitamix for my blender soups. Can you put hot soup in a blender? Yes! Depending on the size of your blender, you may want to work in batches. The cool thing about the Vitamix is the friction of the blades can make steaming-hot soup in under 10 minutes, right in the container; chilled soups take even less time! I hope you fall in love with this pistachio pumpkin soup as much as I did. What are some of your favorite Fall inspired soup recipes! I’d love to hear! Vegetarian friendly pistachio pumpkin soup has notes of nutmeg and all things Fall! This soup is great for a cozy Fall night in or as an appetizer to dinner! While potatoes cook, saute the butter, onions, and garlic in a small pan on medium heat, until onions become translucent - about 5-8 minutes. In a powerful blender, blend the pistachios first. Then, using a slotted spoon, place cooked potatoes in a food processor,then pour in the onion mixture. Caution: when mixing...the blender will get hot, since contents are hot! Add in all additional ingredients (except the sour cream) and blend until smooth. Transfer this into a soup pot on the stove and let it come to a simmer. Then add in the sour cream. Adjust any seasonings if needed, or you may need to add water if you do not like the consistency. Enjoy warm and top with parsley and crushed pistachios! Looks amazing! Great way to welcome fall! This soup sounds fantastic Tawnie! Pumpkins are one of my favourite parts of Fall! Looks delish! Thanks for sharing. Same! Cooking with them…carving them…decorating the house with them…the list goes on! haha Thank you! Love pumpkin, this looks great! Pumpkin soups are my favoriteI love the addition of pistachios in this one.. so creative! Looks SO delicious!! I love creamy fall soups! I am so happy!! Thank you so much! Now pumpkin soup, this is new to me but sounds delicious! I’m sure you’ll love it! Thank you! Thanks Linds! Totally great for a Fall night in or for an appetizer if you have guests over! When the days get colder I always crave warm soups when I get home so I will be putting this on the list of soups I will make this fall! You were right, topping this soup with crushed pistachios was perfection!! So good, my new favorite fall soup! Thank you! I think it adds that perfect crunch! Yay for all things Fall! Making this again this week. It’s that good! So happy you like it!! Thank you!